A book which can be downloaded as a pdf is: Singh, J., Grizzle, A., Yess, S.J. and Culver, H. (2015). Media and Information Literacy for the Sustainable Development Goals: MILID Yearbook 2015. Gothenburg, Sweden: Nordicom. 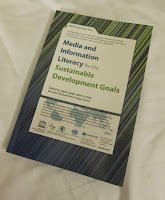 MILID is Media and Information Literacy and Intercultural Dialogue, a programme fostered by UNESCO and UNaOC. There are chapters from different parts of the world e.g.